Here’s another one for the Identity Evropa/AmIM doxx pile! This SPLC-designated hate group was involved in the planning of the deadly 2017 Unite the Right rally in Charlottesville, where Heather Heyer was murdered by a neo-nazi. 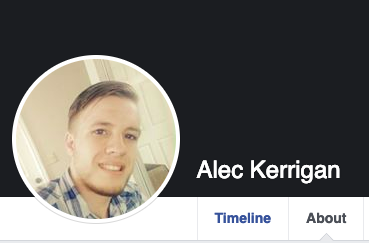 Using messages Alec posted in IE’s Discord server, our researchers quickly learned that Alec’s real name is Alec Kerrigan, he lives in Florida, and he’s in college. 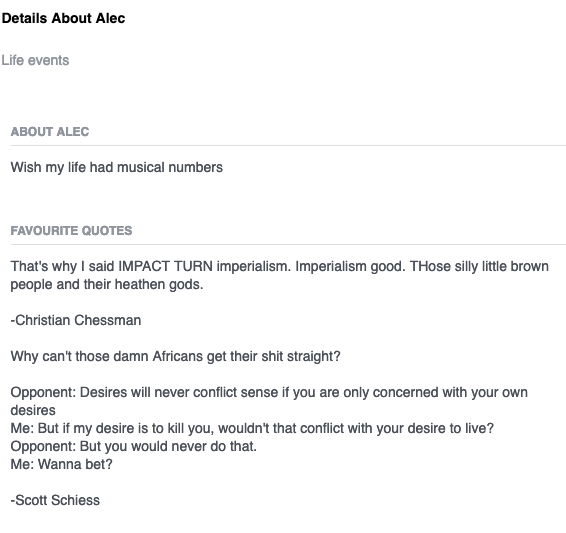 Alec complains in IE’s Discord server about how hard it is to spread neo-nazi propaganda around his school. 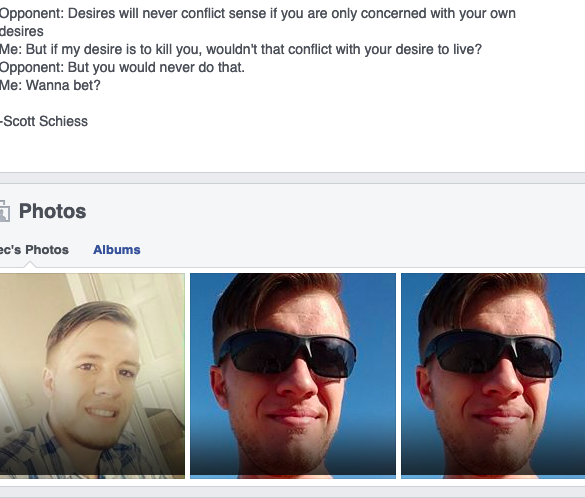 His Facebook “About” page — where he has posted a number of racist quotes — is a pretty obvious indicator of not only his neo-nazism, but also that IE’s “respectability” obsession is just a show. Their thin veneer of optics is a cover for sneering white supremacy and hatred for people of color. 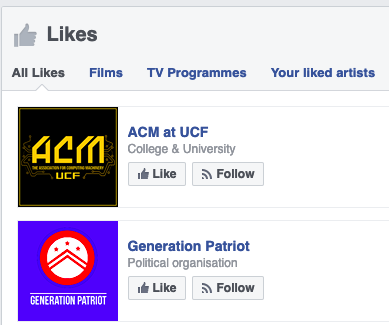 Thanks to his Facebook “Likes,” our researchers pieced together that Kerrigan attends the University of Central Florida. Gotcha! We were able to positively identify that when he’s not posting Breitbart articles to the IE’s Discord server, Kerrigan studies computer science at the University of Central Florida. Since the Discord chats leaked, he’s been trying to clean up his Twitter account so he wouldn’t look like such a racist. He started claiming to “want to help the underprivileged with technology,” deleted his old posts, and started over in an attempt to hide that he’s actually a fascist prick. The danger of white nationalist group Identity Evropa — now American Identity Movement — recruiting from college campuses is multi-fold. 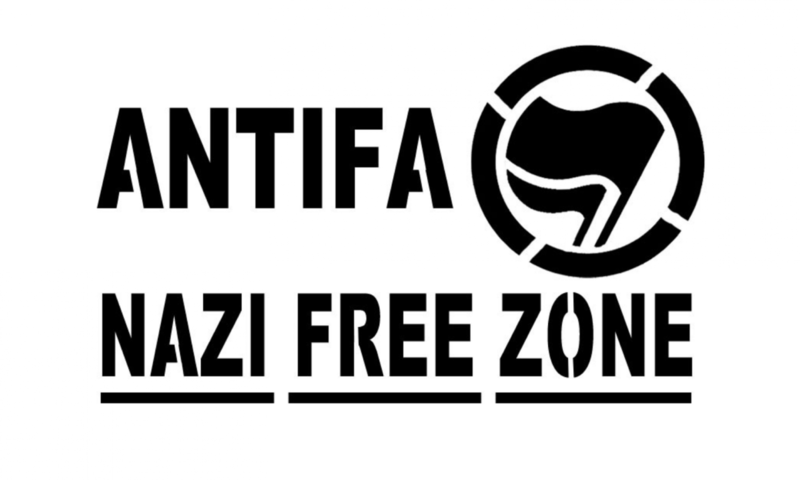 Second, allowing a pro-white, anti-Semitic, anti-gay group to exist on campuses directly interferes with the safety of other students. White nationalist, far-right groups have a genocidal agenda that they attempt to hide behind more “respectable” optics. This sort of organizing on college campuses poses a direct threat to the student body, especially to students of color, queer students, Jewish students, and more. College campuses are already under attack, not only from white nationalist groups organizing there, but from the institutions that protect them. Just last week, Donald Trump signed an executive order connecting research funding for college campuses to the First Amendment. The White House essentially backed white nationalists organizing and speaking on college campuses, posing a direct threat to the student body and their rights to defend themselves. 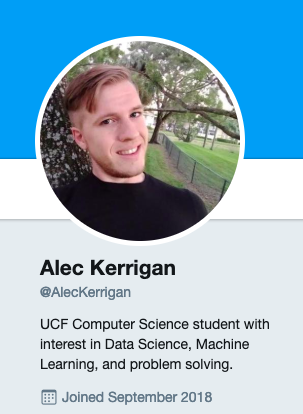 Share Alec Kerrigan’s dossier and tag @UCFcomsci (the UCF Computer Science Department) and @UCF demanding they expel Alec Kerrigan, the white nationalist member of IE from their school for the safety of fellow students. Next PostNext OMGDwayne (real name Mitchell Craig Brooks) you’re doxxed!